I’m purchasing an Xbox Live Indie Game every day, seeking out the quality titles that got lost in the shuffle and no longer appear in the top 50 downloads. Today is day #13, and today’s game is “Let’s Learn Japanese: Beginner”. While not strictly a game, it’s sold through the Indie Games channel so who am I to argue? Let’s Learn Japanese: Beginner has a ridiculous amount of content for its 80 Microsoft Point price. It seeks to teach you all three primary Japanese spelling systems (hirigana, katakana, and kanji), as well as common words. 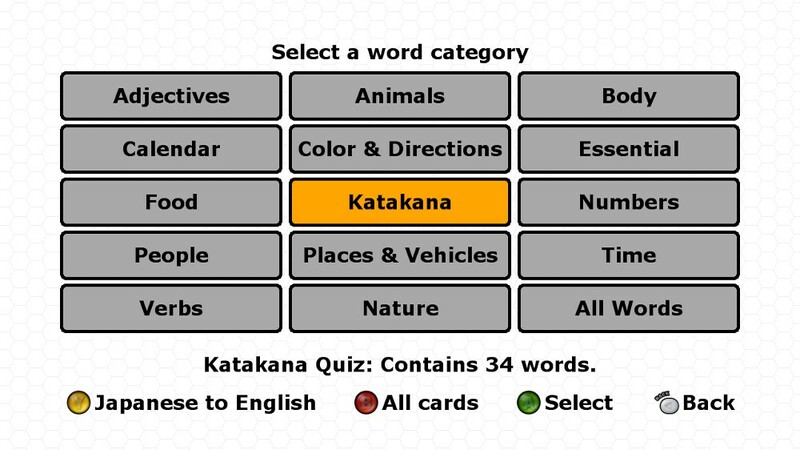 It has flashcard and quiz and modes to help you learn to read Japanese, and review modes to see how well you’re coming along. While it’s for reading only, you certainly won’t speak (and probably not even be able to write) Japanese by the end of your time with the beginner version of Let’s Learn Japanese, anyone with an interest in Japanese language or culture could do far, far worse than spend 80 Microsoft Points on this. As yet there are no “Intermediate” or “Advanced” versions released, but given how good the beginner version is I would love to see more. Good presentation and loads of content make Let’s Learn Japanese: Beginner an absolute bargain.